Your students will love giving you a "hand" making these darling Christmas tree ornaments! 1. Trace each student's hand on the back of medium grit sandpaper. 2. Depending on the age of your students, you may need to cut out the handprint. Don't use your best scissors, the sandpaper will dull them. 3. Each reindeer will take one pipe cleaner. Cut the pipe cleaner in half and then cut one of the halves in half. 4. Punch two holes in the handprint. 5. Have your students put the longer piece of pipe cleaner through the hole closest to the thumb and twist it to secure. They can then twist the smaller pieces around each side of the longer piece to form antlers. 5. Finish off the reindeer with a googly eye, a nose punched out of red glitter paper, and a glittery foam sticker. 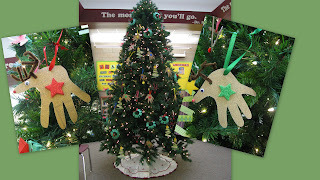 Hang this "hand"some reindeer from the tree with a coordinating ribbon threaded through the hole you punched earlier.